Watching myself on TV always feels awkward--and makes me blush. I love being part of Utah's talented and generous writing community. The 2nd Annual Writing For Charity conference was held this past weekend. = infinite fun (and $8,000 raised to buy books for children). Photo taken by Gailon Tucker. Will someone please rid my garage of evil spirits?!? This time my car battery died, but it did not die alone. It took a fancy computerized gizmo worth $500 down with it. I'm never getting that cute sweater dress. Much thanks to The Story Siren and Alea The Pop Culture Junkie for the this weekly feature. A thirteen year old girl discovers her absent father is the devil. All kinds of craziness ensues. Lara is another 2009 Debutante. I loved the quirky attitude in this book--lots of humor, so many unexpected situations, and really great characters. It's so cute you want to pinch it's cheeks! Tweens are going to love this book when it comes out in October. My daughter is still mad at me for not letting her read it now. So it was a slow week for my bookshelf, giving me a chance to make progress on my rather tall to-read stack. But--I discovered an unused B&N gift certificate (from my birthday last December) in my bedside table drawer. How could I forget about something so important? Tricks (Ellen Hopkins) and Ash (Malinda Lo), here I come! Having spent too much time at the car repair shop today, making my daughter miss her guitar lesson after she'd actually practiced, I figured that a stop at the new cupcakery (isn't that cute?) was a good idea. Okay, cupcakes are always a good idea. Turns out it was Cutsie Cakes grand opening! A cupcake blogger (why didn't I think of that?) was even in the shop having her first taste. 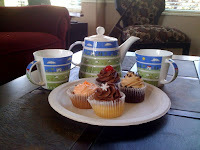 I ordered four of the seven flavors and planned a surprise after school tea party. 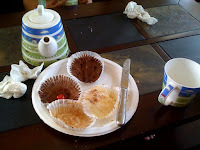 I had a lovely chat with my daughters over cupcakes and tea (something about tea makes us all behave). My 8th grader talked about a lunch time water fight with a guy in her class, but she wouldn't admit to any level of hotness or crushingness. My 4th grader talked about loving math (yes!). I talked about how my friend Kaylie showed up to writing group today with a great nonfiction article and an amazingly revised short story plus a new query (she's an inspiration!). All the cupcakes were delicious and I kind of regretted not trying the lemon ones. Next time! Donut Days by Lara Zielin. Emma's parents are pastors enmeshed in troubles with their church. Emma who naturally questions things suffers through friendship loss, questions about her future, all in the unique setting of a Crispy Dream donut camp (people who gather before a store opening). I read this as part of the 2009 Debutante ARC Swap and couldn't put it down--even to take a shower. This book would be fun to discuss in a book club, especially paired with Evolution, Me, & Other Freaks of Nature by Robin Brande. A historical novel (1960s) about an underdog determined to start 7th grade right. This book won the Golden Kite Award and I've loved all the winners I've read in past years. Plus, Steve gave a really funny and charming acceptance speech at the conference luncheon. About a soccer player whose life turns upside down and she attempts a kissing booth stunt. I'm a big Tina Ferraro fan and just hadn't gotten to this one--so I happily picked it up at the SCBWI ProTrack book sale. Yay! About a girl who runs off to Hollywood. I've loved Lisa Yee's work (Milicent Min, Girl Genius) from the beginning. I once got lucky enough to have her critique one of my stories at SCBWI a couple of years ago and she's as wonderful in person as her writing. I can't wait to read her first YA. Jon and Tania tag along with their mom and stepdad who produce a ghost hunter TV series. And Tania starts to see ghosts! Chris is one of my favorite SCBWI Regional Advisor friends. I'm also excited because I'm always looking for good books for my daughter--and this fast-paced book will delight her. Looks like it's about a girl who is determined to commit suicide. The morning after the conference, I stopped for tea at the hotel Starbucks and saw this ARC sitting all by itself on a nearby table. None of the business types there to attend the next conference seems interested, so I snagged it like a lucky penny. Okay, I'm making myself another cup of tea and then I'll be off and reading again. I never made it past the stick figure stage of drawing, but I love hearing from illustrators (and seeing how their books come alive). I loved how David Weisner (Flotsam) said that "stuff is in there waiting to break out and get used." It made me feel more patient about all the stories I want to write. I've been wanting to hear Karen Cushman speak ever since reading Catherine, Called Birdy when I first started writing for children. She had so much good advice (starting with the caveat to not listen to advice). She told us to do more of what feeds our creativity, encouraged us to read voraciously, and talked about how publication is only one of the reasons we write. "We write because we're writers," she said. I agree! Later she said, "as soon as you learn to trust yourself you'll know what to write." I adore Ellen Hopkins (Crank) in person as well as on the page. Ellen said, "Don't look for the easy way to the top. Be prepared to work hard." She also talked about acting like a professional even before publication (she published dozens of nonfiction books before Crank came out). "Writers and illustrators who love and respect children are indispensable," she said. Illustrator Dan Yaccarino (Zoom! Zoom! Zoom!) talked about how he challenge himself to try new things and always takes advantage of unique opportunities--like creating animated TV shows. He also showed us how he does a lot of artwork for himself that fuels his paid work. "Do what you love. You'll find your audience, you really will," he said. I've become a huge Holly Black (Spiderwick Chronicles) fan after hearing her speak--she's so nice! Holly also told us to read A LOT. "All writing is a conversation of what happened before," she said. I really appreciated hearing her thoughts about the fantasy genre and I'll be adding more of it to my reading list. In a later session about career planning, she said, "You shift what you think when you have a goal." I think that applies not only to writing, but life. Author Ingrid Law (Savvy) read us a story that served as a metaphor for the writing life. About her own writing she said, "I'm not going to judge it or worry about who will like it or who won't." She simply writes what comes to her. Great advice! Kathleen Duey (Skin Hunger) capped off the conference with a talk about what to do after a conference. Her most important message was to stay in touch with the people you meet. "The contacts you make become the backbone of your career." 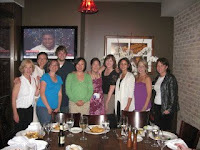 Here are a couple of photos of me with my conference friends! You can read more about the 2009 SCBWI conference at www.scbwi.org. A couple of weeks ago, I spotted a blurb in my newspaper about the Z'Tejas restaurant holding a contest for using chile peppers in a dessert. Oooh! I like to cook and one of my favorite desserts is a frozen chocolate cinnamon mousse--chile peppers could only improve it's rich chocolatey goodness. AND I could name it after my upcoming middle-grade novel: Jungle Crossing...Chill. I excitedly told my husband. He said, "fire potatoes." Okay, so my first attempt at modifying a recipe with chile peppers didn't go so well. A friend had raved about her chipotle mashed potatoes. Great idea, I thought, tossing an entire can of chipotle peppers into the potatoes. My husband had invited a colleague for dinner. You can imagine the gasps of pain, the call for water... the months, years, sure to be decades of teasing about my infamous fire potatoes. Fortunately, dark chocolate is more forgiving. I had to keep adding chile powders to my mousse. With each peppery increase I passed along tastes to my family. Even my kids liked it better than the old version. When I reached the right combination of heat and sweet, I typed up the recipe, emailed it to Z'Tejas, and forgot all about it. Until I got the call--Jungle Crossing Chill made the finals. Yay! Tomorrow I will be making my dessert on Salt Lake City's FOX 13 "Live at 11:00" show with the other two finalists. I've always thought that book promotion should involve chocolate! 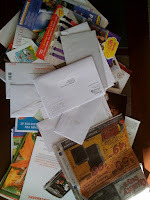 150 + emails to read, loads of snail mail to sort, and all that laundry... So what did I do? I snuck off to the movies with my husband! I'll write up my SCBWI conference tidbits tomorrow. And eventually I'll get around to washing all the Lake Powell sand out of my clothes. PARIS PAN TAKES THE DARE does address the issue of beauty somewhat through Robin's character. In a society where tan-ness is good and fairness is almost considered sickly, I'm sure Robin had many insecurities about herself. And its not just the lightness of her skin either- for her, it was her hair, her outfits... Basically everything about her was ridiculed. She was different, and people like Mayo, made sure she knew it! Personally, growing up, I always thought I was okay to look at, despite the braces and the insecurities about my flat nose. But oh, how differences can make a difference! I coveted those big eyes my peers had. Gorgeous eyes in all different colors. Large, voluminous eyes that can see into your soul! I even tried to draw in bigger eyes in my yearbook photos when I was in jr. high. (And I was shading in the sides of my nose to make it look less flat, too!) EEK! It just goes to show a simple insecurity can be such a big deal when you're younger. To the point that you'll try to doctor your pictures with a ballpoint pen. But I am happy to declare that I am no longer drawing in bigger eyes for myself. (I just look paranoid that way!) And I did give Robin an ending that shows that Robin's character IS about character, and not all of those stupid things kids AND adults spend way too much time thinking about. Twelve-year-old Paris Pan's life is a mess. She's just moved to a tiny town in Nowheresville, Oklahoma; her family life is a comical disaster; her new friends are more like frenemies; and the boy she has a crush on is a dork. Things couldn't possibly get worse, until she discovers that a girl mysteriously died years ago while taking a seventh-grade rite of passage–the Dare– right near Paris's new house. So when Paris starts hearing strange noises coming from the creepy run-down shed in her backyard, she thinks they could be a message from the ghost of a girl. But while she has no plans to make contact with the great beyond, her two new friends have other thoughts. Everyone who's anyone takes the Dare, and now it's Paris's turn. Buy the book here! Cynthea spent her formative years in Oklahoma and Texas where she was a Whiz Quiz member, an Academic Decathloner, and a spelling bee champion. (Yes, she was very popular.) After attending college on the East coast, she worked at a corporate job where she mastered PowerPoint and racked up thousands of frequent flyer miles. Eventually, she traded in her suit for sweats to do the fun stuff–writing for children. In addition to PARIS PAN TAKES THE DARE and THE GREAT CALL OF CHINA (buy it here), Cynthea's nonfiction book WRITING FOR CHILDREN AND TEENS: A CRASH COURSE (how to write, revise, and publish your kid's or teen book with children's book publishers) is available in paperback here. Find out more about Cynthea at http://cynthealiu.com.